E commerce dominates our lives these days. A good E commerce platform is essential for running your business. If you belong to the cell phone repair industry and offer accessories, branded or refurbished cell phones, it makes even more sense to use a platform that propels you towards the right direction. Woocommerce is one of the post popular platforms currently available in the market. Powering over 28% of all online stores, it's a tool that can give you the edge in conducting online business. With Woocommerce you can sell almost anything, whether its digital or physical, anytime and anywhere. RepairDesk is delighted to announce the launch of its integration with Woocommerce. Now repair shop owners can run their businesses online and cater to customer orders in a more effective and efficient manner. Note: Your website should be built on WordPress to use this integration effectively. woo commerse store mush have PUT, GET, POST request enabled from WordPress Hosting Server. - Automatic generation of invoices in RepairDesk as an order is confirmed on your site. 1. Login to your WordPress account and install Woocommerce plugin. You can download the plugin from here. Once the plugin is installed, it will appear in the left navigation menu in WordPress. 2. Click on Woocommerce tab and select Settings from the drop-down menu. 3. In the settings page, go to API tab. 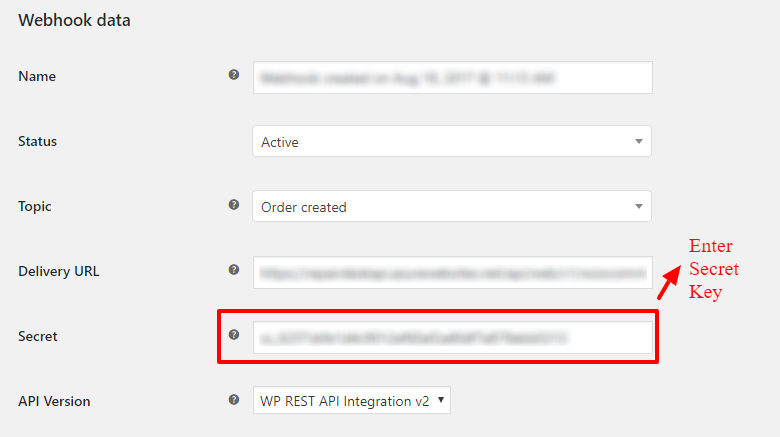 In API Settings enable the trigger "Enable the REST API". Click on Save Changes button to activate REST API. 4. 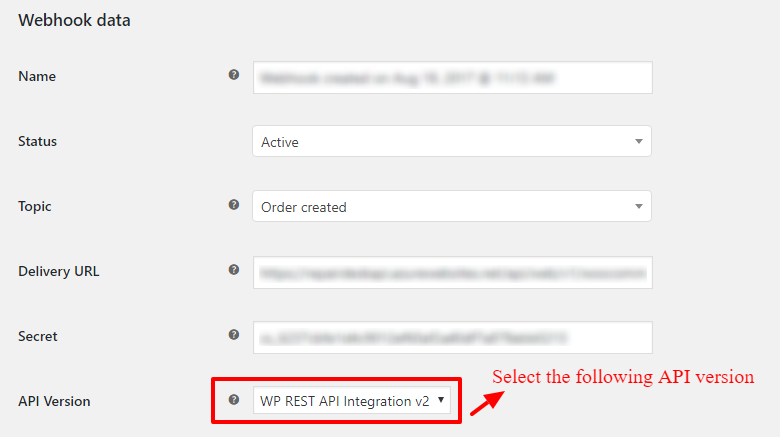 Under the Keys/ Apps tab click on Add Key to generate API Key which will be used to configure RepairDesk-Woocommerce Integration. 5. Under Description enter a name or brief detail about the API. Also, select or add User along with setting API permission to Read/ Write. Click on Generate API Key to get your API key. 6. Once an API key has been generated it will provide you details regarding Consumer Key and Consumer Secret Key. Copy both keys as they will be required in setting up RepairDesk-Woocommerce Integration. 1. You would also need Webhooks for order completion and creation. 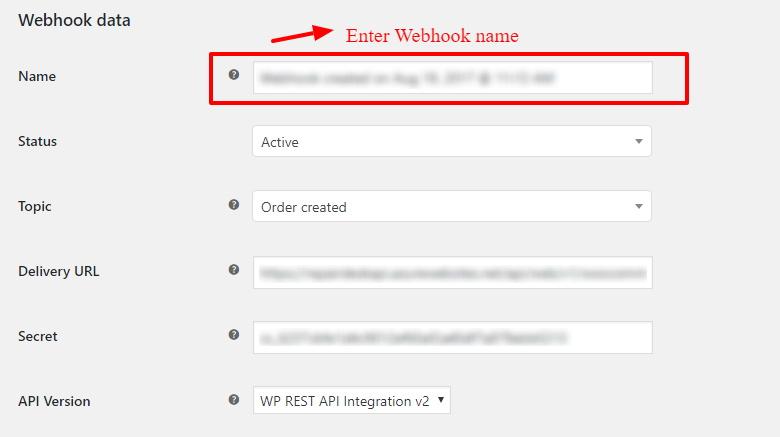 To create webhooks, Click on Webhooks and click on Add Webhook. Note: You would need to create two webhooks: one for Order Creation and the other one for Order Update. Separately create both of them. Once done, click on Save Webhook to add it. 3. Similarly create another webhook for Order Updated. 4. create another weboohk For Product Created. Similarly, we can create webhook for Product deleted or any other if we want out of this list of values. After Creating this webhook products created on website will sync with Re[airDesk. 1. Now login to RepairDesk and go to Integrations page. Select Woocommerce from the menu. 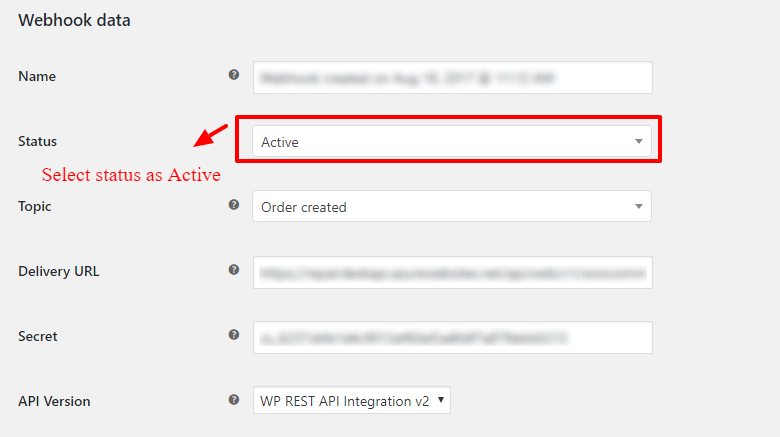 On the Woocommerce integration settings page click on Setup. Select the store for which you need to setup woo commerce integration. URL to your Woocommerce Site: Enter base URL for your Woocommerce site (wordpress). Consumer Key: The consumer key provided to you when you are created API key. Consumer Secret: The consumer secret key provided to you when you generated API Key. Once you have setup configuration and saved these settings the integration will be activated and the trigger " Enable Sync to Woocommerce" will be enabled automatically. Enable Sync to Woocommerce: Activate integration and sync RepairDesk items with Woocommerce. 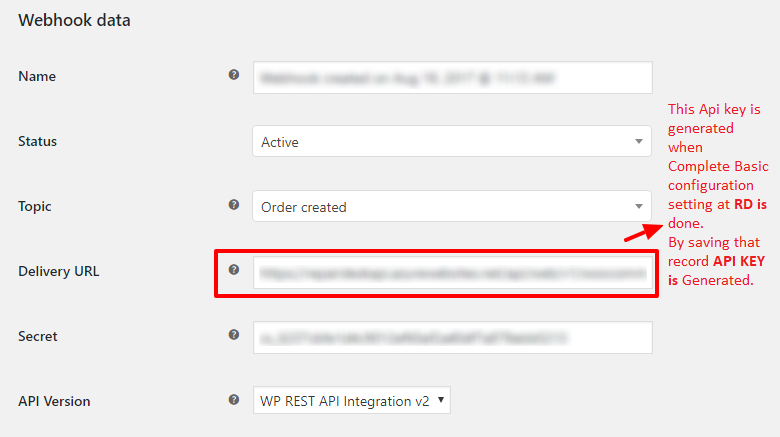 Note: This trigger will be enabled automatically once you have set up integration with WooCommerce. 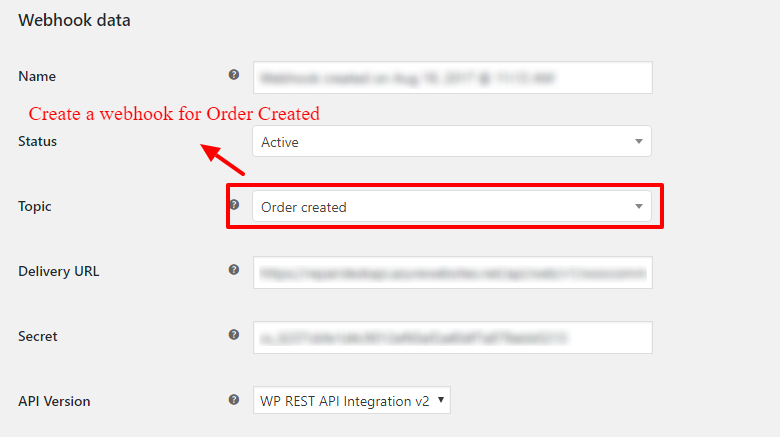 Create invoice when order created: If this trigger is enabled, invoice will be generated automatically as an order is created on your site. Sync prices: Synchronizes prices of all items between RepairDesk and Woocommerce site. Sync Product Description: If this trigger is enabled, product descriptions will automatically get updated on RepairDesk when updated on Woo Commerce Integration. You can add online price for item which will displayed on website. if both retail and online price are given in the system in that case online price will be sync with website. Your product categories such as accessories, battery, cables etc in RepairDesk can be displayed on your Woocommerce site. You can select the product categories in the integrations setting page which you want to display on WooCommerce site. All items under selected categories will be synced with wooCommerce and will appear on your site. 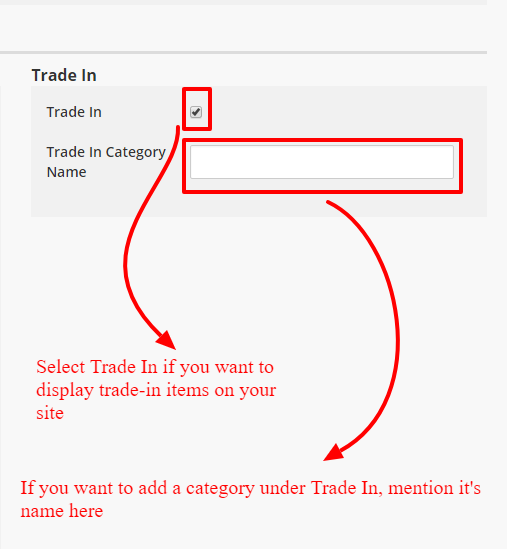 You can select items which are under a category synced with RepairDesk to be displayed to not to be displayed on WooCommerce site. 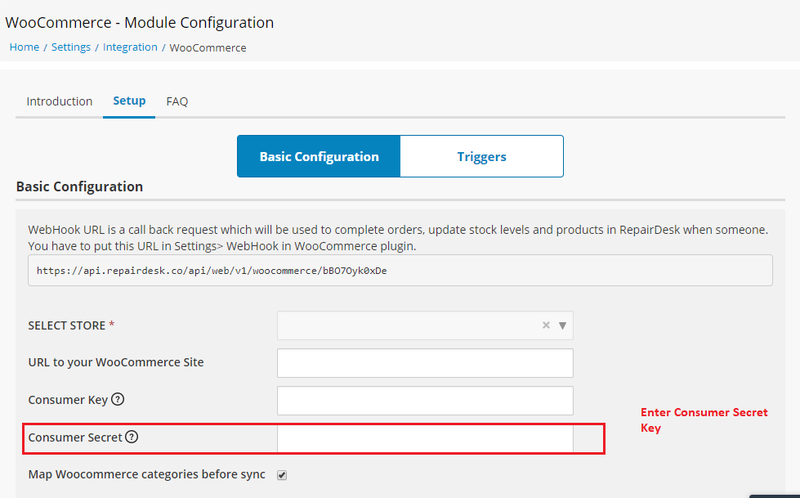 To un-sync such in item, just open the item in RepairDesk and under Triggers disable the trigger: "Sync with Woocommerce". Similarly, if you want to enable sync for a particular item, just enable the trigger "Sync with Woocommerce" and that item in RepairDesk will be synced with Woocommerce site. Here we would also like to mention something about stock update and item details. Stock Update: RepairDesk's WooCommerce Integration will automatically update your stock in RepairDesk and WooCommerce as an order for a customer is completed. If a customer orders a particular item and it's order is completed, the stock in RepairDesk and WooCommerce site will automatically be updated. Item Details: After you have enabled integration with Woocommerce, details of an item in RepairDesk will also appear on Woocommerce. These details consist of basic information such as item name, price, stock levels etc. 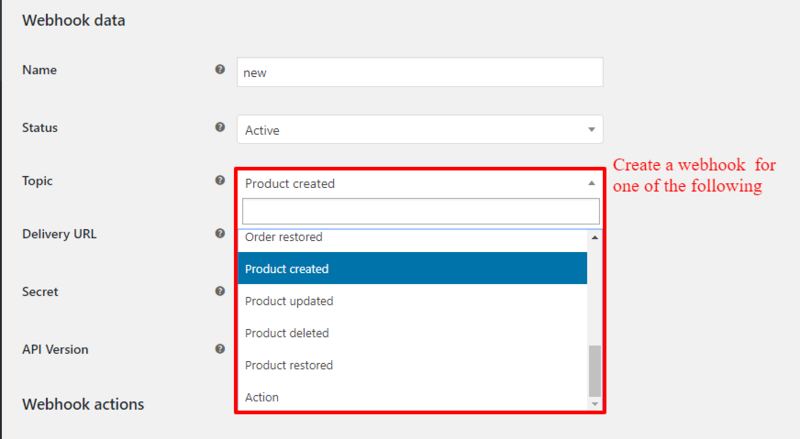 Now let us show you how to enable product categories in RepairDesk. 1. All of your item types will be appearing below. Select the type/ categories of items you want to sync with Woocommerce site. 2. If you're dealing with trade in item, select the Trade In option. If you want to create a category for under Trade In, enter its name in the field: "Trade In category Items". Note: Once a trade-in item is synced with WooCommerce the item name will be displayed on your site in the following format: "Manufacturer - Device - Color - Size - Network - Condition". E.g. "Apple iPhone 6 Black 64GB Verizon Like New". 3. Finally, click on Save button to complete configuration and voila! You have successfully integrated woocommerce with RepairDesk. Invoices: Before we close, we would like to mention how an invoice in RepairDesk is linked with a customer's order on your Woocommerce site. When a customer places and order and that order is marked as completed, it is synced with RepairDesk. RepairDesk will not only fetch customer details and display them in invoice but would also mention the Order ID against which the invoice is generated. The Order ID will help you in identifying which invoices were created against customer's order on your online store. Other details such as items in customer order and paymnet details will be added to invoice in RepairDesk once the order status has been marked as completed from Woocommerce backend. Q. Does this integration support serialized inventory? 1. When integration is enabled, item in RepairDesk will be synced with WooCommerce. 2. When a customer selects the item in order and the order is confirmed, this item will be added to customer invoice. 3. After order status is set to Order Completed the invoice will be synced with RepairDesk. 4. Finally, once the invoice is added to RepairDesk, under item details you will be able to see serial numbers for this particular item. Manually select the serial in invoice and hit Save. Q. Can I import items from Woocommerce site to RepairDesk? A. No. This integration work in one-directional and will only import items from RepairDesk to WooCommerce. Q. Some items are not being synced. Why is that? A. Only items with SKUs will be synced. If an SKU for an item already exists then the item will be updated. A new item will be added to Woocommerce if that SKU is not present on Woocommerce site but exists in RepairDesk. Q. Can I select some items to not to be synced with Woocommerce? A. Sure! 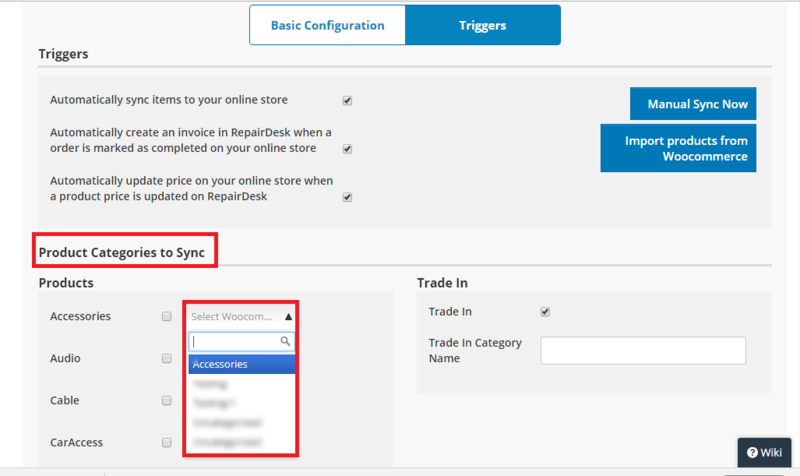 Just open the item in RepairDesk and under Triggers disable the trigger: "Sync with Woocommerce". Q. I've set up the integration but stock is not updating. Why is that? A. Please confirm that you have created and updated webhooks. In the absence of a webhook the stock will not be updated on your site. Q. Do I have to manually add customers in RepairDesk who buy items from my site? A. No. Once an invoice is created, customer data is fetched and customer is added to RepairDesk. Q. When are payments added to RepairDesk? A. Once a customer has booked an order on your WooCommerce site, it will not be added to RepairDesk until you have confirmed the order from backend. Please select the order status to "Order Completed" to mark it as completed. Once an order is confirmed and marked as completed, payment details for that order will be added to RepairDesk. Q. How long does it take to sync items from RepairDesk to Woocommerce? A. Once you have setup WooCommerce Integration, your items are automatically and instantly synced with WooCommerce. Q. Will the item photos be displayed on my site as well? on your WooCommerce site once you have enabled WooCommerce integration with RepairDesk. Q.How can i map categories of RepairDesk With Woocommerce? Here you can maps RepairDesk catagories with Woocommerce by selecting from Dropdwon. 2. we can also mapp item categories individually , if items category is mapped individually then Priority will be given to individual item. Q.on which bases items are sync with repair desk? A.Items are based on SKU, if SKu is already present then that item will be updated and if their is no SKU macthing then new item will be added in the system.